What is a Lifekeys Partner Church? "I wish there had been something like this for me and my siblings years ago- it could have nipped some grief, fear and rejection in the bud. "My child has managed anger and has been able to express feelings in a safe environment." "_______ loved the physical games with a male facilitator." "________was able to share a lot of deep emotional trauma that he wasn't able to share with me. I feel he has been unburdened by the experience." "My kid says ' I'm not the only one!" 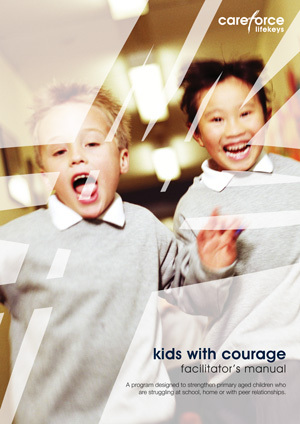 Kids with Courage is a seven session program that aims to strengthen primary aged children (7-12) who are struggling with issues at school, at home or with peer relationships. The program is used as both prevention and intervention for children. It is a program that builds on the strengths of the child and develops emotional resilience. It has been developed by a team of child educators, psychologists and welfare workers and includes drama, puppetry, hands on activities and small group work. The Co-ordinator of this program must have professional qualifications in a child-related area. Facilitators must have similar qualifications, or else have proven experience in working with children. All those involved in this program must have undergone a police check. The program has a lion mascot who models problem-solving skills in a non-threatening atmosphere. Throughout the program children have an opportunity to explore feelings, set goals, interact with peers and find positive ways of making changes. The aim of this session is to assist the children to identify and express their feelings. This session seeks to assist children with establishing protective behaviours and gives children strategies for resisting peer group pressure. This session aims to raise awareness of personal behaviour, to introduce problem-solving skills, and to provide modelling and practice of appropriate communication. This session focuses on providing children with an opportunity to express feelings of grief and loss, and to develop strategies for dealing with grief and loss. In this session children will recognise that anger is a natural response and identify appropriate ways to express anger. This session aims to develop awareness that fear and worry are normal emotions and to model, process and practice strategies that assist in minimising anxious, frightened feelings and behaviours. The aim of this session is to promote healthy self-esteem and to convey to the children that everyone has value. Helping our local communities find Christ through their brokenness remains one of the greatest untapped evangelistic tools available to the church today.